Sports massage isn’t just for athletes. Sports massage techniques are suitable for both sports people and non-athletes alike and can help with injuries, chronic pain, muscle aches and restricted range of motion in all of us! It can help be an effective therapy for releasing muscle tension and restoring balance to the musculo-skeletal system, optimising flexibility and maintaining a healthier physical state. You do not need to be a sportsperson to benefit from a sports massage. The treatment can also help relieve many day to day problems such as repetitive strain injury, sprains, work related tension and fatigue. Nearly all of us must have stood up after a long stint at a desk or sitting in one position and felt the need to stretch arms, legs or backs – it is this natural desire of the body to have its tissues in a flexible state that a regular massage can help with. A constant build up of tension in the muscles from regular activity may lead to stresses on joints, ligaments and tendons. This overuse can often create problems and imbalances in the soft tissues and if ignored, can lead to chronic long terms injuries which may affect improvement and performance. 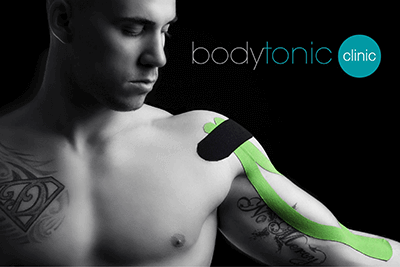 Kinesiology taping can be combined with sports massage if necessary. It allows for movement in the affected tissues, but has the ability to aid the lymphatic and muscle systems, substantially reducing recovery times, whilst improving range of motion and muscle activity.